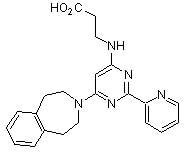 Potent and selective H3K27 histone demethylase inhibitor (IC50 = 60 nM, JMJD3). Inhibits UTX. Some activity for the H3K4me3/2/1 demethylases Jarid1b and Jarid1c (IC50 values are 950 nM and 1.76 μM, respectively). No significant inhibitory activity against 100 protein kinases at a concentration of 30 μM. Anti-inflammatory effects. Publishing research using ab144396? Please let us know so that we can cite the reference in this datasheet. There are currently no Customer reviews or Questions for ab144396.